The Rubber Cafe Design Team Blog: Life is a Grand Adventure! Today's card features the Going Places kit. For the background paper on this card I used Tim Holtz Distress Spray Stains in Salty Ocean and Wild Honey. Once dry, I stamped the images with a Onyx Black Versafine Ink Pad. I used the embossing folder included in this kit, wrapping twine around it and then finishing it off with a flair button. I used the heart from the So Many Places set to separate my sentiments. 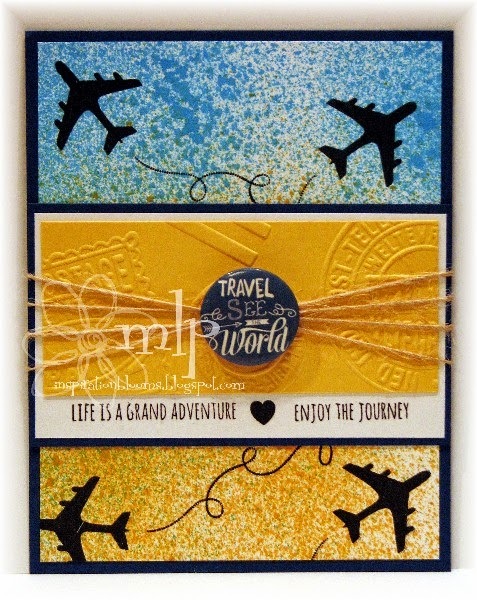 Stamps, paper, flair, twine, embossing folder: Going Places kit.